Notes on translating Archaïscher Torso Apollos (Rainer Maria Rilke). Typically, in translating poetry, there are several issues a poet encounters. One is that a literal, word for word translation seldom works, neither in a poetic, nor in a purely linguistic sense. Often, the way a source language is delivered and understood differs substantially from the result of such translation of a given sentence. You can test that premise yourself, by translating into English and then back again. You will find differences compared to the original. A literal translation will give you the gist of a piece, but more often than not it will produce an unsatisfactory interpretation and a poor poem. Another problem is one of maintaining a balance between what the poet wrote in h[is/er] own language and how that can be presented in a poetic form in the target language, without losing either the spirit of the piece or its essential poetic feel. To produce a satisfactory poem, you should be looking for a result that is close to the original in meaning, in spirit, and in form. That brings us to the third issue, which is that of rhyme. How do you cope with translating a Sonnet that has a Petrarchan rhyme scheme (a-b-b-a, c-d-d-c, e-e-f, g-f-g)? Perhaps the best advice is to ignore the rhyme scheme. If you are after a contemporary translation, the rhyme scheme is likely to be of secondary importance; probably non-essential. Hard enough as it is to produce an effective translation, it is even harder to achieve a matching pattern of rhyme. And the worst possible sin is to force the rhymes, just for the sake of conformity. Maintaining the overall form and meter is a more realistic goal. A common mistake people make when translating is to take too many liberties, with sense and tense, and word choices. In a faithful interpretation, if a stanza is in the past tense, the translation also must be in the past tense. You cannot change 'we knew' to 'we know' and bring key phrases into the present tense, and still retain credibility in the face of critical analysis. Furthermore, if the poet has used strong imagery and made definite word choices, the translator is duty bound to try to preserve those images and word selections, wherever possible. You cannot change an uncommon candelabrum into an everyday gas lamp and expect the (dead) poet not to roll over in h[is/er] grave in an attempt to extinguish your low wattage tribute. If you do such things, you're in danger of straying too far from the meaning and the spirit of the original. 3. Heinrich Heine, in Gedichte (1851), Romanzero, in the poem Präludium – Neue Blumen, neue Düfte! Unerhörte, wilde Düfte, Die mir in die Nase dringen, [New flowers, new scents! Unheard-of, wild scents, that press upon my nose,]. As the statue's head in modern times has been long unheard-of – who knows where it is – the usage seems appropriate. A further thought might produce something on the lines of 'No one heard tell of his long absent head' or in a more studied manner, 'Of his long absent head, no one heard tell'. The second noun is one that gives most translators a real problem, because die Augäpfel – eyeballs (pl.) – conjures up little that's poetic. However, Rilke used die Augenäpfel, which may be subtly different (b.t.w., it's not olde German, which was Ougapfel) or merely colloquial usage. That notwithstanding, there is a phrase, mein Augapfel, which means 'the apple of my eye' (as in 'my favourite' or a loved one). Did Rilke intend the phrase to be a metaphor or just to represent how the absent head might have appeared, had it and its eyes been in situ? Either way, a more poetic phrase than 'therein the eyeballs ripened' needs to be found. Perhaps Rilke used the image of 'ripening' as a metaphor for awakening intelligence or maturing knowledge. If that be the case, a translation of 'therein knowledge awakened/stirred' (in which the eyes grew wise) would do better than most recent translations, which seem to take a far more literal approach to this phrase. The preposition darin also gives a slight problem as 'therein' is archaic [sic] usage (in English, albeit not in German, which retains many of such usages). In translation, you have to go with language from Rilke's era or German usage, or more contemporary English; take your pick. With der Bug der Brust, many translators resort to an adjective instead of the first, descriptive noun. Fine, if that's the best they can do, but surely it would be far better to stick with a noun. After all, if der Bug translates to 'the prow', which it does, what is wrong with an interpretation of 'otherwise the prow of the breast could not dazzle you'? It wasn't the curved or curving breast that fascinated Rilke, it was der Bug der Brust; a chest like the proud prow of an Achaean ship sailing forth to conquer Troy. The phrase zu jener Mitte, die die Zeugung trug is another one that causes difficulty. Literally, it means 'to yon centre [the one] that bore the procreation'. Awkward, to say the least. The use of 'bore' is straightforward (simple past; Imperfekt or Präteritum in German) and the use of 'yon' can be retained or discarded in favour of 'that' depending on contemporary preferences. So really, it's the interpretation of Zeugung that gives rise to the problem. What did Rilke mean? To the procreation of what or whom was he referring? Is this another metaphor? Is that too many questions? It's feasible he presented us with a metaphor for the conceiving and bearing of a child by the marble core out of which it (the statue) emerged. Many a sculptor will tell you the image is in the raw material, just waiting to be brought forth – or born, or begat, or fathered (all synonyms for procreation). Alternatives such as 'to yon centre [the one] that sustained the fathering', or 'to yon centre [the one], which bore the sculpture', therefore, spring to mind. For now, you may contemplate 'to yon centre that bore the fathering'. When we come to unter der Schultern durchsichtigem Sturz, it must be accepted that this is a genitive (possessive) description i.e., 'under the durchsichtigem Sturz of the (pl.) shoulders'. What we are left with then, is the quandary of interpreting the adjective and its operator. Using 'plunge' (or perhaps 'cascade') for Sturz seems like a no-brainer as commonly found alternatives e.g., 'falling' and 'faded' seem to be just that; common i.e., lacking any semblance of poetic resonance. Options for durchsichtigem are: transparent; crystalline; pellucid; translucent; luminous; or explicit. You might consider 'under the pellucid plunge of the shoulders' as a holding option, not least, because it has an element of alliteration to it; a device that many enjoy. And so we come to the final, major conundrum, the phrase und flimmerte nicht so wie Raubtierfelle, which is difficult, primarily due to the lack of specificity hindering the identification of the predatory animal Rilke had in mind. Strictly speaking, we should use 'pelt' or 'fell'. It may be acceptable to choose to name say, a lion and its mane or go with a generic 'beast of prey', however, as Raubtier seems such a deliberate word choice, with only the one possible translation i.e., predator, using that, if at all possible, seems like the better choice. Anther point worthy of mention is Rilke's opening line. It is simple past (Imperfekt/Präteritum) and cannot be 'we never knew', which would be a translation of wir kannten nie, or 'never will we know' or 'we cannot know' or 'we'll never know', which are all present or future constructs. Literally, it means 'we knew not' or, in a more contemporary English, 'we didn't know'. The former is poetic, but archaic; the latter is dismally bland, but any deviation from those must adhere to the simple past. 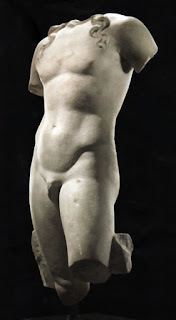 In Archaïscher Torso Apollos, Rilke's subject is a headless statue of Apollo, a deity from ancient Greek and Roman mythology who has been variously recognized as a god of light and the sun, and appositely, as the patron god of music and poetry for whom Hermes created the lyre. Rilke's poem, which is a Petrarchan sonnet, is in a sense, a hymn, a paean to Apollo. The statue is broken, headless, disfigured, yet it seems to retain something of its god-like power; a smouldering, dormant, yet palpable glory, which seems somehow incandescent to the observer, transfixed by its latent force. This blind, but all-seeing statue can penetrate your very soul – there is no place you will be unseen. You cannot hide from the truths it unmasks with its inescapable stare. In consequence, you must change your life – you must face those truths. the central core that bore its selfsame sire. where you will be unseen. You must change your life.